Last weekend, Eugene and I met my brother for brunch at a restaurant here in the city. It was kind of late in the day, and freezing outside, so as soon as I spotted clam chowder on the menu, I was sold. It was listed under the lunch entrees for $13, so I figured it would be a large-ish, hearty bowl, and didn't order anything else except a small appetizer of toast with fresh ricotta. But when the food arrived, I was confused. The bowl the waiter gave me was filled with the TINIEST amount of soup I have ever seen in my life. It was about 1/2-inch in depth and covered with a handful of oyster crackers. I put my spoon in, and the soup barely came halfway up the spoon. There were seriously more crackers than soup. Both Eugene and my brother were equally shocked, leaning over to peer into my bowl and wondering if perhaps I'd ordered something from the appetizer menu (there was only one soup listing, and it was under entrees) or if it was one of those things where they give you the bowl with the fillings and then pour the broth on top (it was not one of those things). Eugene mused that perhaps they were running out of soup and rationing it. What made it worse is that the soup (all three tablespoons of it) was delicious! 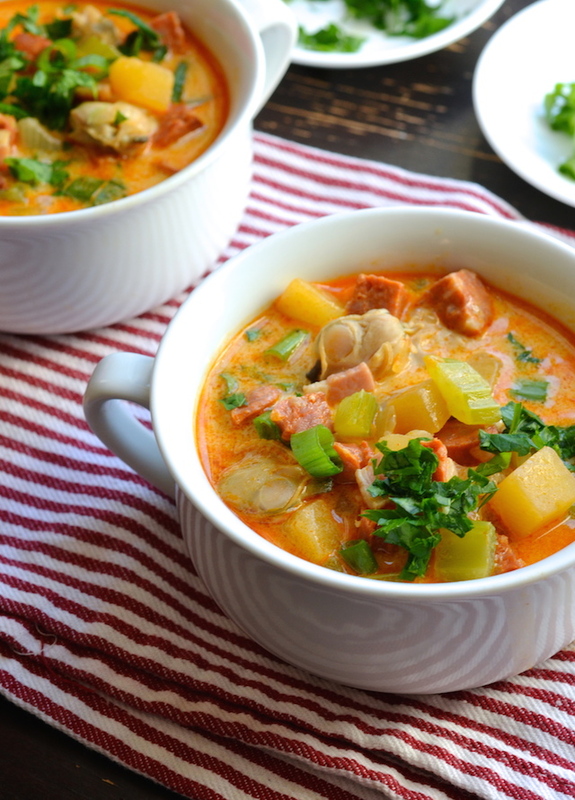 Creamy and smoky, with tiny perfectly cut cubes of potatoes and bacon. There were only 2 clams in it (literally), but at least they were lovely and chewy. Gone in less than a minute, I spent the rest of the meal thinking about how I definitely needed more soup. 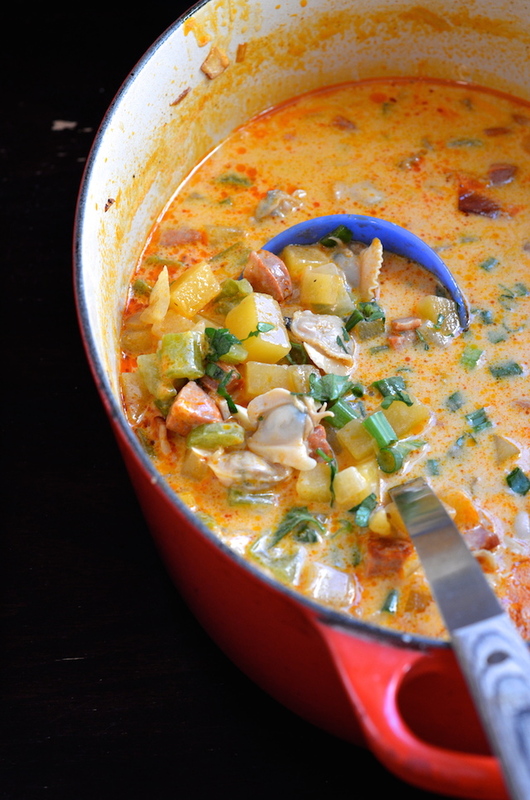 Hence, this Spicy Chorizo Clam Chowder recipe! Let me clarify that this is NOT a classic, thick New England clam chowder. 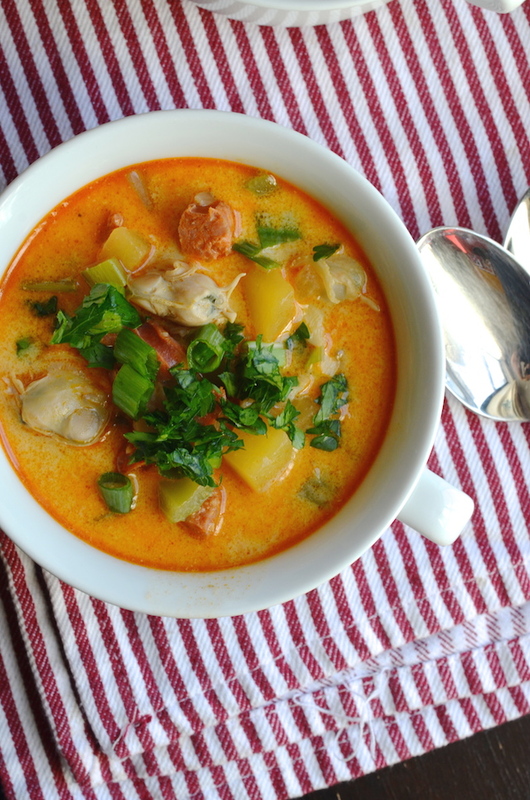 This is something a bit looser and brothier, with a smoky and salty briny broth, loaded with chunks of clams, chorizo, celery, and (my own twist) rutabaga. It's still creamy, but it isn't thickened in any way with flour or cornstarch and the lack of potatoes helps keep it a bit looser. You can use potatoes if you prefer, but I honestly love the lightness of rutabaga in this otherwise hearty soup. I'm not quite fully over the trauma of the world's tiniest bowl of soup, but this spicy generous chowder definitely did help a bit. Combine the rinsed clams with 2 cups cold water in a medium saucepan over medium-high heat. Cover and let steam until the clams open—about 8 minutes. Remove all the open clams, then re-cover and continue to cook any that haven’t opened for an additional 1-2 minutes. If they still don’t open, discard, but reserve the cooking liquid. Strain the liquid through a sieve lined with cheesecloth or other fabric, discarding any solids and reserving the remaining liquid. Remove the clams from their shells, and place in a bowl covered with a damp paper towel (this keeps them from drying out). Combine the chorizo and bacon in a large, heavy-bottomed pot, and sauté until bacon is rendered and chorizo is slightly crisp. 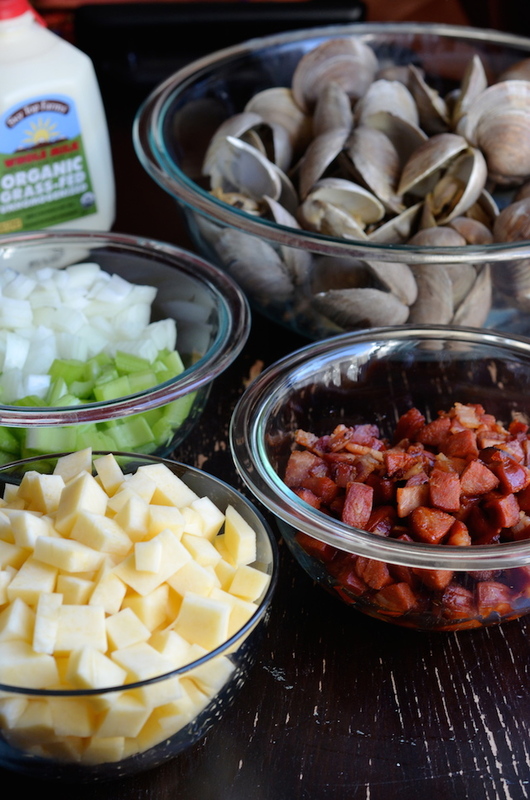 Use a slotted spoon to remove the bacon and chorizo, leaving the fat in the pot. (If your bacon isn't very fatty, you may need to add a teaspoon or two of oil). Add the celery, onions, garlic, paprika, and rutabaga, and sauté 2-3 minutes, just to soften them a bit. Add the strained clam liquid + 1 1/2 cups of water, and cook until the rutabaga is tender (about 10-15 minutes). Add the milk, cream, chorizo and bacon, and let simmer gently for 10 minutes (do not let it boil or the milk will curdle). Stir in the clams, and let simmer an additional five minutes. Taste and adjust seasoning with salt and pepper as desired. Garnish with parsley and scallions before serving.